In the last couple of years I’ve grown to realise what a great ingredient rye is. My consistent ‘go-to’ beers from London Brewing – the mighty Mad As Hops when they have it, and the almost-as-good Rye ‘The Hell’ Not when they don’t – are both Rye IPAs. At the same time, when it comes to American whiskies, the more rye you get in it, the better it will taste. 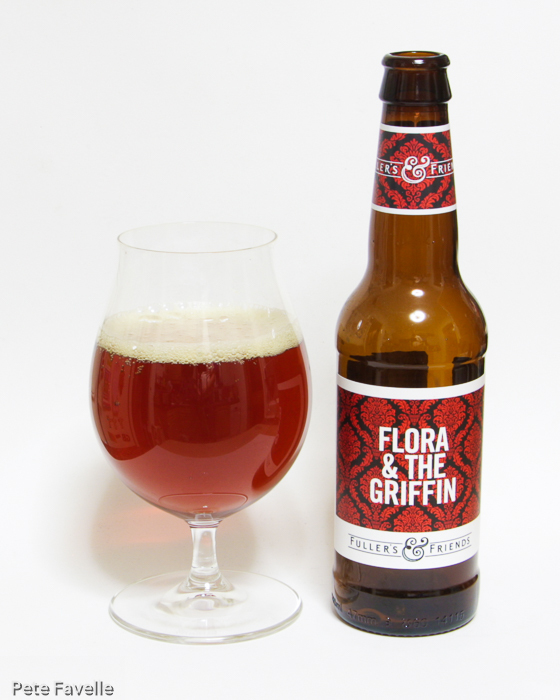 Flora & The Griffin is a 7.1% ABV red rye ale from Thornbridge – an impressive pedigree combined with one of my favourite styles has set my expectations high. The appearance is good; a rich red ale, albeit with a very fleeting, open textured head. The aroma is floral and hoppy, with some spicy notes and a hint of grain to it as well. In the mouth, it’s surprisingly fruity – cherries and a little toffee, which yield to a heavy hitting bitterness that has a nice edge of resin to it. There is a touch of warmth from the alcohol, but the carbonation is heavy handed. I feel a little disappointed by this one, and I know that it’s mostly because of my high expectations. It’s a very nice, tasty rye ale but I can’t help mentally comparing it to my favourites and it just isn’t quite up there. 3.5 stars.